http://twitter.com/aveyou – Follow AveYou on Twitter!! http://www.facebook.com/aveyou – Like AveYou on Facebook! awesome hair. you must have a really good cut too because it’s just perfect! 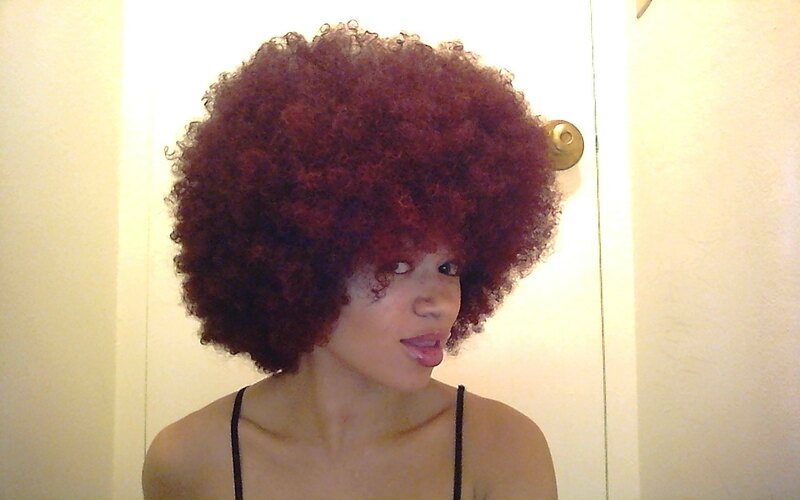 Dig your fro! I think it’s better than Jackie Brown. On the DC Heaven in Hair, I tried it as a deep conditioning treatment. I cannot say I fully liked it. I felt some of my other choices do better job on my hair such as Bee Mine Deep Conditioner and even a newly tried Redken Nature’s Rescue Cooling Deep Conditioner. It was OK for me the Heaven in Hair but not overly thrilled myself. It is quite pricey with equal price of the Bee Mine Bee-U-Tiful Deep Conditioner. Now, you know you are gonna have to give the deet’s on how you got that ‘fro, right?! Ha! You should’ve had a pistol and push-up bra in the video review! Your ‘fro looks awesome! The color kick’s it up a notch, too! All I did was comb my hair out, lol! I’m telling you guys…my curl pattern goes CRAZY if I detangle it out the shower. And thank you!